Cramer: Lowe's or Home Depot? Recently, Home Depot has emerged as the superior operator and Jim Cramer thinks he knows why. Did you miss "Mad Money" on CNBC? If so, here are some of Jim Cramer's top takeaways. The home improvement stores had been one of the few bright spots in retail, Cramer told viewers. That was, until recently. 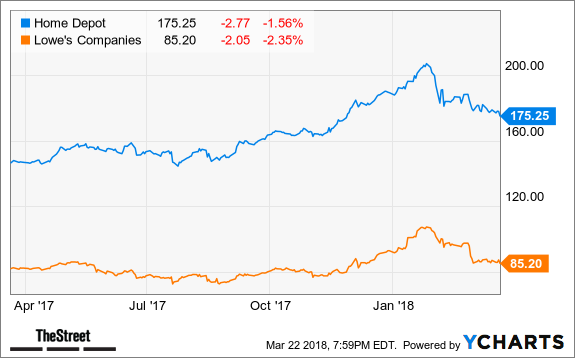 So with Home Depot (HD - Get Report) and rival Lowe's (LOW - Get Report) both off 7.5% from their highs, which one should investors be buying into the weakness? Before the financial crisis in 2008, Cramer said his answer would have certainly been Lowes. But in more recent years, Home Depot has emerged as the superior operator and Cramer said he thinks he knows why. Home Depot was the first to embrace new technology, Cramer explained, leaving Lowes behind the curve. Years ago, the company gave employees smart phones and began developing apps for everything from inventory management to customer service, something that has helped it snag more of the lucrative contractor market. At the same time, Lowes became distracted by acquiring Rona, a Canadian home improvement chain with 245 locations. Eventually, Rona may become a big asset for Lowes, but at the moment, the chain is not adding to the company's bottom line. Home Depot shares trade at 17 times earnings, compared to just 14 times for Lowes. That multiple is warranted however, as Cramer said Lowes is the riskier stock. That's why he's sticking with Home Depot, which continues to deliver superior same store sales growth and better earnings per share. With the markets under pressure, Cramer and the AAP team are calling PayPal (PYPL - Get Report) out of the bullpen and into the portfolio. Find out what they're telling their investment club members and get in on the conversation with a free trial subscription to Action Alerts PLUS. Over on Real Money, Cramer says this decline, this turmoil, isn't about the Fed or iterest rates. Get more of Cramer's insights with a free trial subscription to Real Money. At the time of publication, Cramer's Action Alerts PLUS had a position in PYPL.